The brethren of Mersey Lodge No 5199, together with their guests gathered at Ormskirk Masonic Hall to witness the installation of William Knibb as their WM for a second year and the fourth time as WM of the lodge. For the evening’s ceremony the lodge was honoured by the presence of Assistant Provincial Grand Master Frank Umbers as the principal guest. Frank was accompanied by the Ormskirk and Bootle Group Chairman Graham Chambers, vice chairman Malcolm Alexander, grand officer Roy Pyne and acting Provincial grand officers Rick Walker and Barry Jones. Frank Umbers (left) congratulates William Knibb on taking the chair for the fourth time. The meeting commenced with the WM William Knibb, warmly welcoming the brethren and the visitors to the lodge, saying: “I hope everyone will have a good evening in the temple and at the festive board and I wish everyone a happy new year”, before proceeding to open the lodge. Once the initial lodge business had been completed, the DC, Peter Blazey, announced Frank Umbers was without and demanded admission. Frank was then admitted into the temple accompanied by the grand and acting Provincial grand officers. William then warmly welcomed Frank to the ceremony and offered him the gavel of the lodge, which Frank gracefully declined. William then handed the proceedings over to the installing master Stephen Andrews, who asked Joe Williams from Crosby Lodge No 3714 and Derek Midgley from Rufford Lodge No 7217 to assist the lodge by occupying the chairs of senior warden and junior warden respectively and Jim Roberts from Vale of Skelmersdale Lodge No 8719 to act as the inner guard. The master elect William Knibb was then presented to the lodge and after William had taken his obligation Stephen installed him into the chair of King Solomon according to ancient custom in an excellent ceremony. The working tools in all three degrees were presented in an excellent and proficient manner by Peter Blazey and once the lodge’s officers had been invested, the address to the WM was given by Peter, followed by the address to the wardens by Les Donnell and the address to the brethren of the lodge by Frank Umbers; all delivered in a confident and excellent manner. The brethren of the lodge singing the master’s song. At the end of the ceremony of installation, Frank addressed the brethren by bringing congratulations from the Provincial Grand Master Tony Harrison, wishing William and all the brethren the very best of health and hoping they have a happy Masonic year. 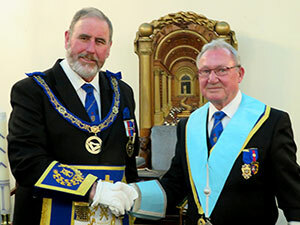 Frank stated that he had attended all the lodge installations since the lodge has been located at Ormskirk, before congratulating Stephen for the excellent and the most, sincere manner in which he had installed William into the chair. Frank then proceeded to congratulate all the brethren who had taken part in the ceremony. The ceremony now being completed, William had the privilege to presented Frank on behalf of charities with three cheques; £300 for the MCF 2021 Festival, £100 to the Ormskirk Masonic Hall and £200 to Tithebarn. On behalf of the recipients Frank thanked the lodge brethren for their very kind and generous donations. After closing the lodge in prayer and harmony the brethren made their way to an excellent festive board consisting of vegetable soup as the starter, followed by braised beef and seasonal vegetables for the main, lime curd tart and ice cream for dessert and a cheese board to finish. 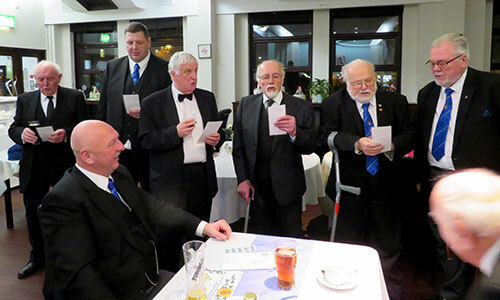 During the festive board the master’s song was sung by the members of the lodge which is a usual custom of the lodge and a raffle was held which raised £206 which will be donated to Masonic charities at a later date. In response to the toast to his health the new WM William responded by thanking everyone for their support and especially the brethren that had assisted in the ceremony that evening. Pictured from left to right, are: Barry Jones, Graham Chambers, Roy Pyne, Frank Umbers, William Knibb, Stephen Andrews, Malcolm Alexander and Rick Walker.